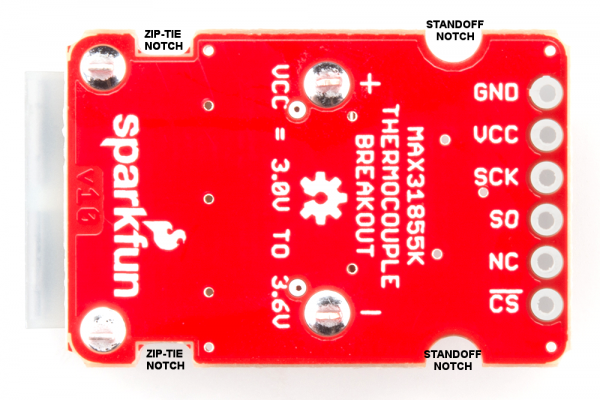 The MAX31855K Thermocouple Breakout is a simple 14-bit resolution, SPI-compatible, serial interface thermocouple digitizer that makes reading a wide range of temperatures possible. We've broken this device out on a breakout board along with all the necessary componets to make using it a breeze! This breakout is designed to be used in conjunction with a k-type thermocouple such as this one shown below. In this tutorial we're going to get you familiar with the workings of the MAX31855K. We'll go over how to hook it up to a our 3.3V Arduino Pro Mini, but you can use this breakout board with nearly limitless other options. Anything that can communicate over SPI will do. It can be as 'simple' as a custom set of logic gates, most micros, or as complicated as yours server's motherboard. Make sure you are using 3.3V, or level shifting into the range 3.0V to 3.6V. We'll close the tutorial out with some example Arduino code. 36" high temperature Type-K Thermocouple with glass braid insulation. 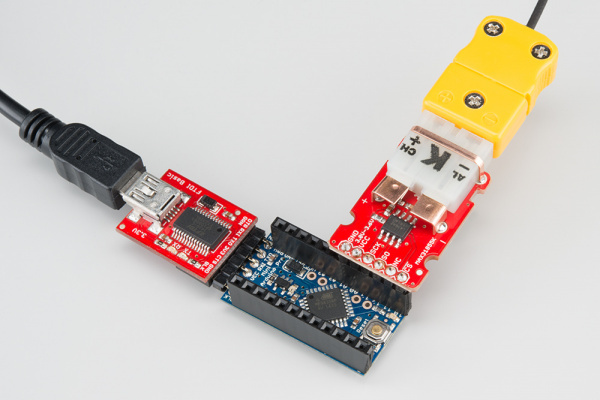 A 3.3V Arduino board such as our 3.3V Arduino Pro Mini, or another microcontroller running at 3.3V or any with a logic level converter or two. To connect the breakout to the microcontroller, you will likely want some male headers, or you could use a few pieces of wire. PCC-SMP-K Thermocouple Connector - Allows one to plug in a standard thermocouple. 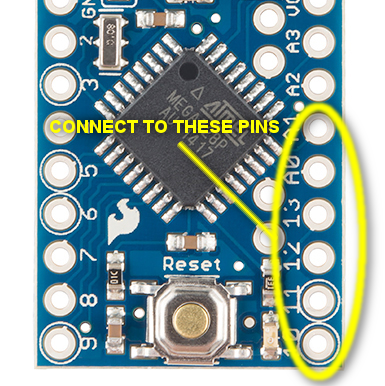 In order to get a good, solid, electrically-sound connection to the breakout boards, you'll need to solder to the pins. That means you'll need at least a basic soldering iron as well as solder. Check out our how to solder tutorial for help, if this is you first time soldering. Roughly a couple hundred years ago, a man named Thomas Seebeck discovered the principal that thermocouples use. He noticed that if you take two wires made of dissimilar metals, connect them at the two ends, and make a temperature gradient between one end and the other, a voltage potential formed, and current flowed. One junction is held in the environment where the temperature of interest exists. This is known as the hot junction. The other junction is referred to as the cold junction. 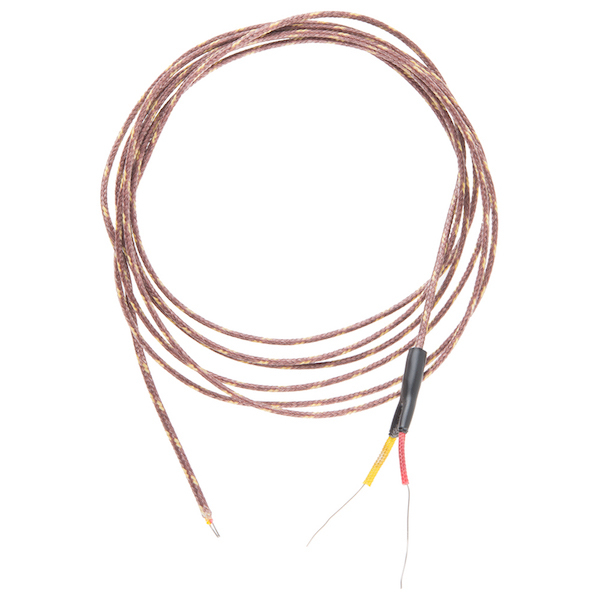 There are many types of thermocouples, which mainly differ by the types of metals used in the two wires. The most common general purpose thermocouple is type K. They are made out of chromel and alumel. These two alloys produce a potential of approximately 41.276 µV/°C. The MAX31855K uses this linear approximation to calculate the temperature. The thermocouple’s hot junction can be read from -200°C to +700°C with an accuracy of ±2°C. The cold junction is inside the MAX31855K and can only range from -20°C to +85°C while maintaining ±2°C accuracy. The MAX31855K constantly measures the temperature of the cold junction using an internal temperature-sensing diode. The internal 14-bit ADC uses the above equation, the voltage across the internal diode, and the amplified voltage of the thermocouple to solve for the hot junction temperature. The calculated temperature is clocked out the SO pin in a SPI compatible format (half-duplex). When not feeding out data, this pin is tri-stated and will ingnore any inputs from the master. A reading of 0b 0000 0000 0000 corresponds to 0°C. Whereas 0b 01 1001 0000 0000 corresponds to a measured temperature of +1600.00°C, and 0b 11 1100 0001 1000 corresponds to a measured temperature of -250.00°C. Now, let's dive in and see how to connect the Thermocouple Breakout. The first assembly step is creating a reliable, electrical connection from the breakout to your control board. You'll need to solder either headers or wires to your breakout boards, deciding if straight or right-angle headers or wire work best for you. If you're going to stick the breakout board into a breadboard, other prototyping board, or an Arduino Pro Mini, straight male headers might be the best choice. You might want to solder some right angle headers to the short edge of the Pro Mini so it's easy to plugin the FTDI Basic. The MAX31855K requires from +3.0V to +3.6V (+3.0V nominal). Since the MAX31855K only draws 1.5 mA maximum, this tutorial will use D14 for power. This lets use line up all of the SPI and power pins on one compact row. One could also power the board from any similar power supply. As covered in the previous section, potentials are formed due to a temperature gradient between junctions of dissimilar metals. We want to minimize the number of these junctions ideally down to two: the hot at the end of the thermocouple, and the cold at the MAX31855K. Every connection in addition to these can skew the reading. The breakout board is designed to accept a standard thermocouple connector, for convenience and compatibility with probes you may already own. These connectors aren't necessary, and you could solder a thermocouple directly into the through holes labeled '+' and '-'. If you decide to solder the thermocouple directly to the breakout board, it is recommended that the thermocouple be mounted for strain relief to avoid breaking the thin wires. Notches have been provided in the PCB opposite the header for this purpose. One could wrap the thermocouple around this part of the board and squirt on some hot glue, or a zip-tie can be wrapped around the notches to hold the thermocouple. These zip-tie notches can also be used to attach the board to your project. What your circuit might look like if you solder the thermocouple directly to the PCB. For ease of use in this particular application, I chose to solder female headers to all holes on the top of the Arduino. I also soldered a male header to the bottom of the breakout board. There is no need to mount the breakout board, but we have provided several ways to make it easy. Hot-glue and double-sided foam tape work, as always. We also provided notches for zip-ties. Grab a zip-tie, loop it around the PCB and any object, and pull it tight. There are also notched out holes for our standard standoffs and screws. find or make two holes 20 mm apart, center-to-center, and screw the board down. These same notches can also be used for a zip-tie, some conductive thread, or let your imagination go wild! When you open the Library Manager you will find a large list of libraries ready for one-click install. 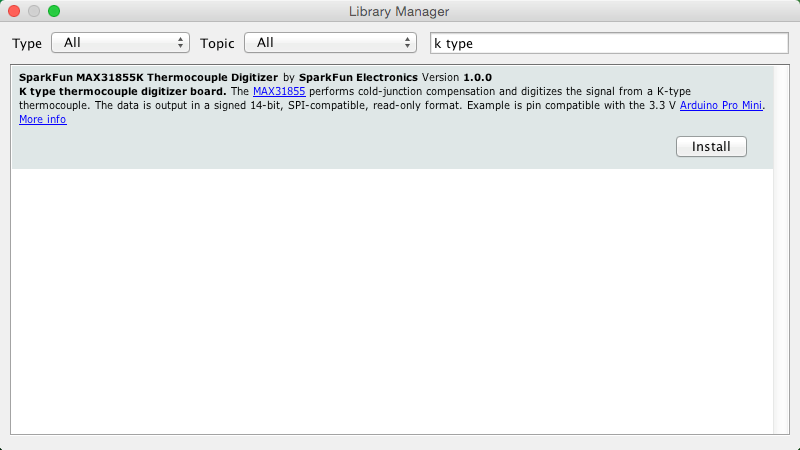 To find the library for this product, search for 'k type' or 'digitizer', and the library you want will likely be the only option. Click on that library, and the 'Install' button will appear. Click that button, and the library should install automatically. When installation finishes, close the Library Manager. Now that the library is installed, an example sketch can be found in the 'Examples' submenu. Open this example. // Read methods return NAN if they don't have a valid value to return. // The following conditionals only print the value if it's not NAN. This block of code, found above the setup function in the main sketch, is where you will configure the pins used to communicate with the MAX31855K breakout. If you are using another board, or another power supply, you will want to edit these! Warning: Even if you don't plan to use D10 as the chip select pin, the Arduino SPI library will set it as an output anyway. If it ever becomes a low input the Arduino will turn into a SPI slave and cannot communicate with the MAX31855K. Before using the serial monitor, you must call Serial.begin() to initialize it. 9600 is the "baud rate", or communications speed. When two devices are communicating with each other, both must be set to the same speed. All of the temperature reading functions return floating point values. Floating point numbers are any number that isn't a whole integer number. '1' is and integer, while '1.01' is a floating point number. One special floating point number is NaN, or Not a Number. It represents things that aren't real numbers such as 0/0 (divide by zero is 'undefined'). If a temperature reading function returns NAN it means that a real temperature wasn't read, and it's time to check your hardware. 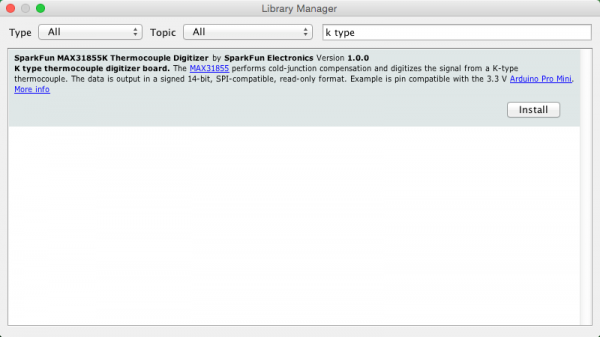 At this point the hardware should be correctly connected, the library should be installed, and the example sketch should be opened. 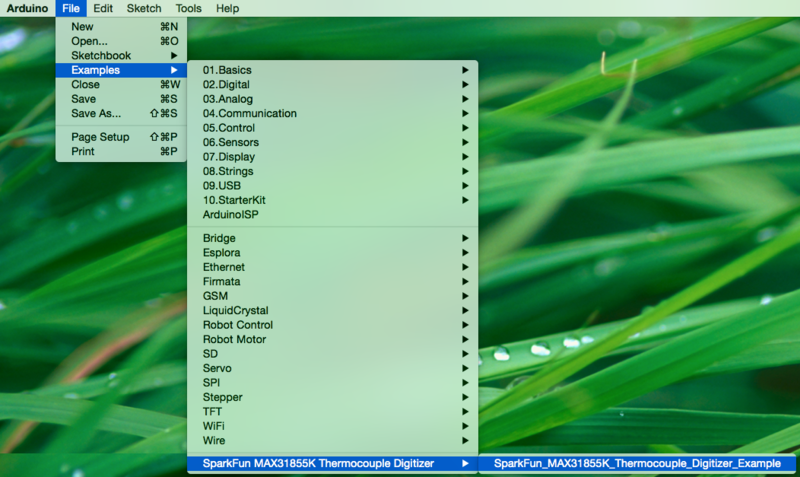 Select the correct serial port in the 'Port' submenu of the 'Tools' menu. Click the 'Upload' button, or sleect 'Upload' in the 'Sketch' menu. The code should compile and be uploaded to the Arduino. Once the code upload finishes verifying, open the serial monitor (found in the 'Tools' menu). You should be able to read the temperature your thermocouple is detecting on the serial monitor in the Arduino IDE. If it isn't working, make sure you have assembled the circuit correctly and verified and uploaded the code to your board. Beginning... only prints once to mark the beginning of the code running. The next two lines show the Cold Junction Temperature (CJT), followed by the thermocouple measurement in a handful of common units. The CJT is the temperature of the breakout board, and the other temperature reading is that of the tip of your thermocouple. These two lines of temperature readings should be updated and reprinted every 3/4 of a second. This program has no outward indication it is working. To see the results, you must open the Arduino IDE's serial monitor. This happens because the serial monitor is receiving data at a different speed than expected. To fix this, click the pull-down box that reads "*** baud" and change it to "9600 baud". Try pinching the sensor with your fingers to heat it up or pressing a bag of ice against it to cool it down. Boiling water should be about 100°C, while ice should be about 0°C. 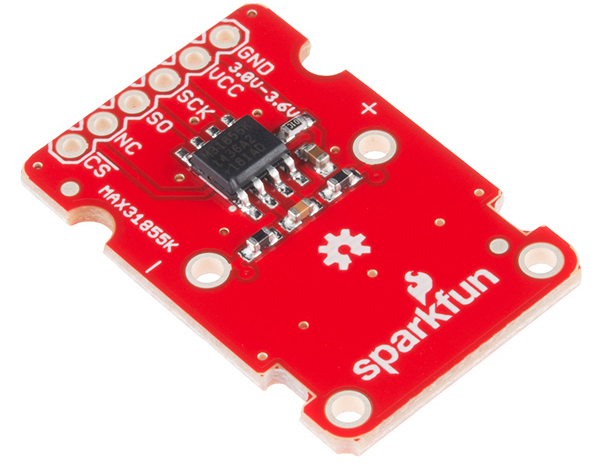 Check out these other great tutorials from SparkFun. Vernier Photogate Timer -- using the Serial Enabled LCD Kit.